Exquisitely crafted by smiths who have dedicated their lives to the forge, masterwork weapons are worth more than an average peasant might see in a lifetime. These weapons are perfection in steel, and they're made with such grace and skill that they enhance the fighting ability of any warrior who wields one. The Vikings had a name for a sword like that. The Ulfberht. What is the Ulfberht? A genuine Ulfbehrt sword was forged from high-carbon, crucible steel to form a blade that was flexible enough to bend rather than break, which held an edge better than any iron, and which was valued more than gold or jewels. Viking chiefs and heroes carried these blades with pride, and as far as men of the time knew these swords were made with two parts metal to one part magic (there's even references to smiths who would use the bones of great beasts or dead warriors to heat their fires, which is pretty damned badass). Men were willing to shed blood for these blades, and those strong enough to carry them were feared indeed. This is particularly true since the Ulfberht was centuries beyond the iron age technology used by the Vikings' enemies. 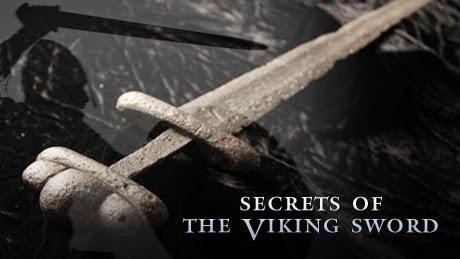 In Secrets of the Viking Sword we get to watch as a modern-day swordsmith recreates the forging of one of these ancient blades using the tools and materials of the time. Free to all right here on PBS, this is a program that should not be missed. If you want to keep up to date with all of our updates here at Improved Initiative then plug your email into the box on the top right, or follow us on Tumblr or Facebook. If you'd like to do your part to keep us going then feel free to toss your pocket change into the "Bribe the DM" button on the upper right, or drop by our Patreon page and become a patron today!